We offer indoor/outdoor runs in two sizes; inside dimensions 3'x4' and 4'x4': outside 3'x6' and 4'x6'. The run doors are open from 7am to 9pm weather permitting. 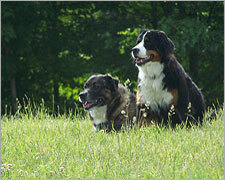 Dogs are let out to run in our 3.5 acre fenced area a minimum of 5 times a day. There is also an indoor playroom for those days when the weather is just too nasty. The dogs are allowed to play with the daycare animals with owner's consent. Each animal's daily activity is recorded on an observation sheet and a copy is provided for the owner on dismissal. Any dog staying more than 5 days will receive a complimentary bath the day before pickup. Tuesday thru Friday we provide playtime and socialization for dogs. Tuesday, Thursday and Friday's are for larger dogs and Wednesday is for small dogs. The dogs get interactive group play with up to 15 dogs. Play consists of a swim in the pool, Frisbee, ball, wrestling or just plain running! We also have a mid-day naptime. Please refer to the Daycare Recommendation Information Sheet for more information. Animals may have a bath during their stay at the owner's request.